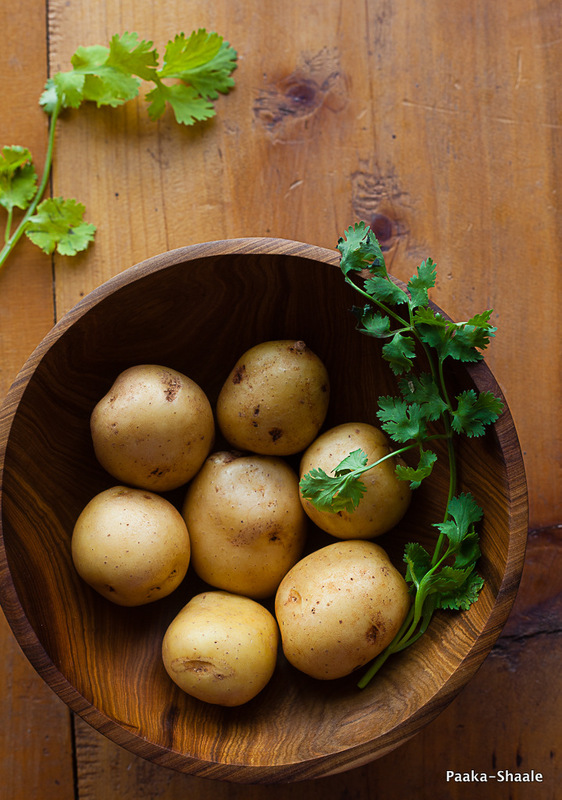 Potatoes are something I reach out to when I am stuck with the question of "what should I cook?" These tubers are so versatile that there are so many ways to make them. And all of them are sure to turn out delicious. You can either make a simple stir fry out of them or you can turn it into a scrumptious and rich yogurt based side dish like this one. process of cooking is called as dum cooking. 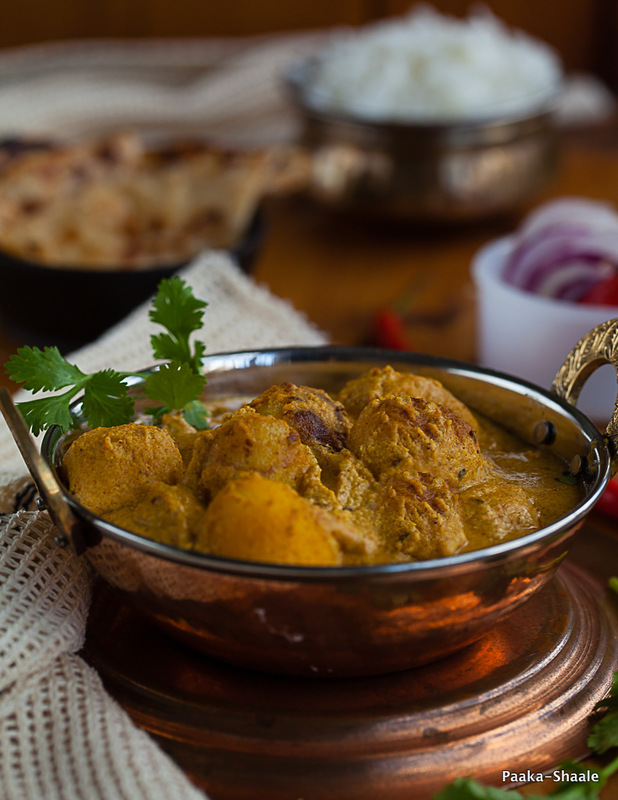 During the cooking process, the spice infused yogurt is absorbed by potatoes making them almost dry. 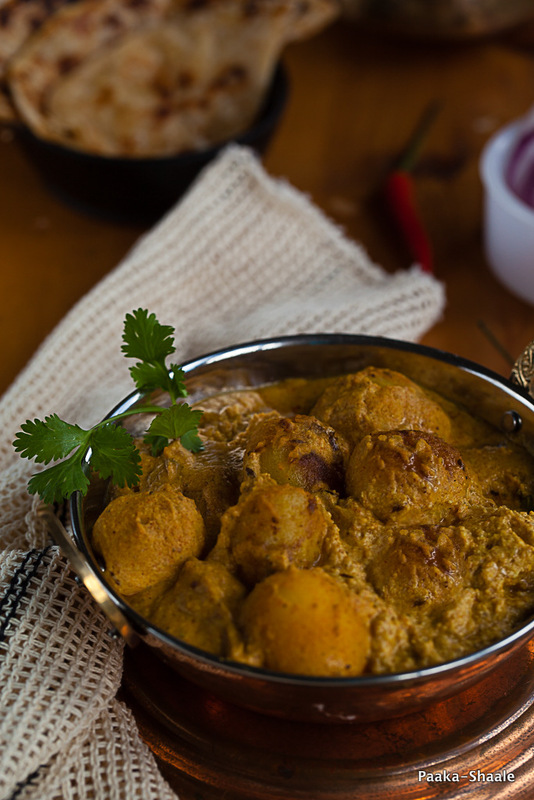 The most important step in making the dum aloo is to prick the potatoes with a skewer or a tooth pick. This ensures that the spices and flavors are completely absorbed by potatoes. The spices used in this recipe depends on the individual taste and varies from recipe to recipe. In this version I have used dry ginger powder, kashmiri red chili powder, fennel seed powder, cumin-coriander seed powder and a pinch of garam masala. The deep, roasted flavors of the spices is balanced by the sweet yogurt and the hint of cream. Also, do not hold back on the clarified butter (ghee). For it helps in taking the flavor quotient up by a notch. 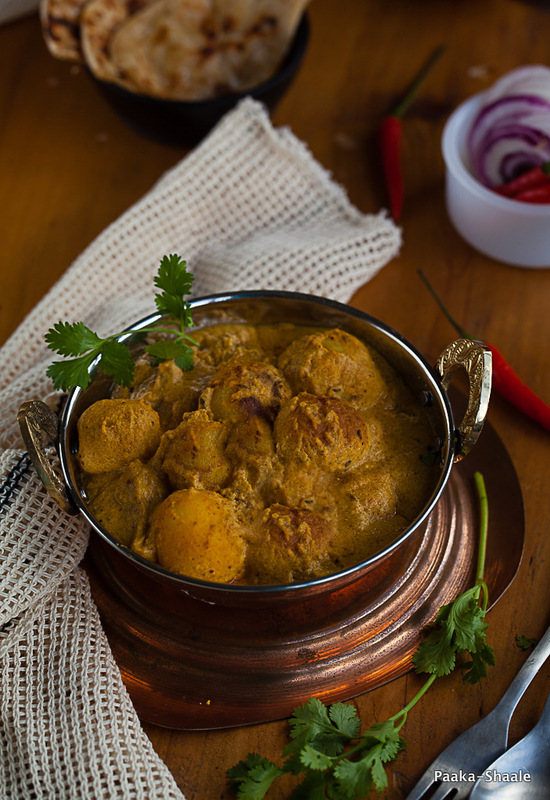 The Kashmiri Dum aloo is a great recipe if you are looking for a great recipe to satisfy your hungry stomach and tickle your taste buds. But I believe that this sweet and spicy curry does something more than that. It satiates your soul. Boil the baby potatoes in enough water till fork tender. Drain and allow the potatoes to cool. Peel the cooled potatoes, prick them with a tooth pick and set aside. In a bowl, whisk the yogurt along with the ginger powder, fennel seed powder, cumin-coriander seed powder, red chili powder, turmeric, salt and sugar and set aside. Heat two table spoons of ghee in a thick bottomed pan. Add the boiled potatoes and fry till they turn golden in color. Take off the heat and set aside. Add another table spoon of ghee to the same pan and add the cumin seeds. Once they turn brown, add the asafetida and fry for a few seconds. Stir in the cooked fried potatoes and the yogurt mixture and cook covered for on low heat for 15-20 mins. Add the garam masala and the cream. Mix well and take off the heat. 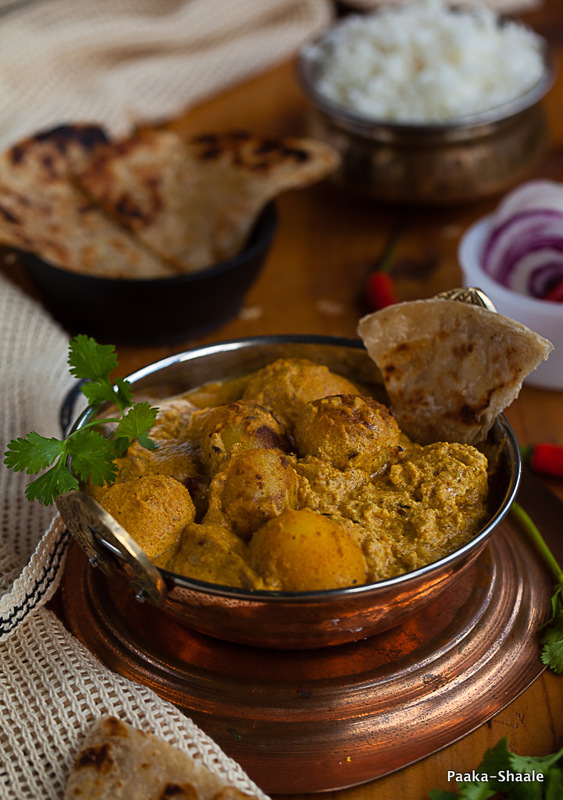 Garnish with coriander leaves and serve hot with rotis, parathas or rice. Very beautifully captured! This reminds me of the authentic Dum Aloo made by a Kashmiri friend that I had at a party long ago. Its been a couple of years since then, but I haven't forgotten that taste yet. I loved it, despite potatoes not being my all time favorite. 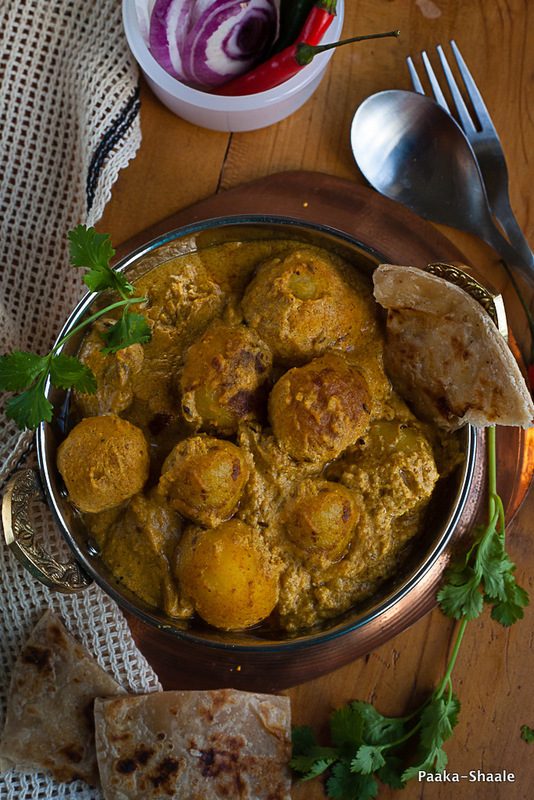 I am yet to try Kashmiri Dum Aloo, the authentic version at home. You've just tempted me to give it a try! That's an easy recipe.this is too good..will surely give this a try.I loved it, despite potatoes not being my all time favorite. Anyway I will try this out.Can you please share here the more cookies preparation details.I love to see your updates on this and waiting for read that.